Not long ago a minor, unnamed creek drained the bogs south of Arrow Lakes and Calamity Lake in an extremely isolated area of northeastern Minnesota. Now a family of industrious beavers has built dams to create two large ponds. 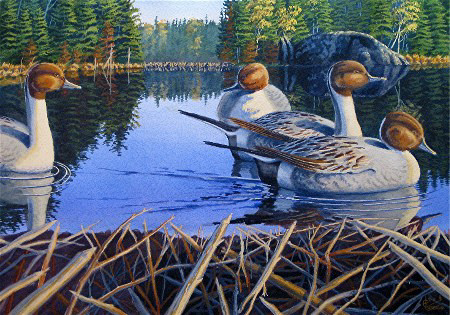 Four drake pintails are enjoying the peace and solitude of one of these ponds on a late September afternoon. It’s odd that there are no hens with this group as flocks generally have a mix of males and females.But weather at times can separate flock members during migration when they;ride the cold fronts down from the far North.